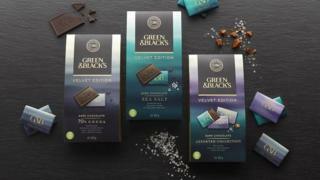 Green & Black's, which pioneered organic Fairtrade chocolate, is launching its first UK product without a Fairtrade or organic label. The new Velvet Edition dark chocolate bars go on sale in the UK this month. Instead of the Fairtrade mark, it carries the Cocoa Life certification, set up by Mondelez International, the owner of Green & Black's. Mondelez calls Cocoa Life "a holistic, cocoa sustainability programme in partnership with Fairtrade". And unlike all other Green & Black's bars, there is no organic label. Glenn Caton, Northern Europe president of Mondelez, said: "These beans are not available in organic at the scale required for Green and Black's, but I am proud that they are sustainably sourced, independently verified beans from the Cocoa Life programme, of which Fairtrade will ensure we remain an accountable partner for farmers." Green & Black's was founded on the Portobello Road in London by Craig Sams and Jo Fairley in 1991. Three years later, its Maya Gold bar was the first chocolate in the UK to be awarded the Fairtrade mark. All its ranges, apart from the Velvet Edition, will continue to be organic and carry the Fairtrade logo, which is considered to be one of the most widely recognised and trusted ethical brands in the world. Mondelez, formerly Kraft Foods, owns Green & Black's through Cadbury's, which bought Green & Black's in 2005, before being bought itself by Kraft in 2010. Its Cocoa Life branding is now rapidly replacing the Fairtrade logo across all its chocolate products. By 2019, Cadbury's entire chocolate range in the UK and Ireland - including Flake, Twirl and Wispa - will display the Cocoa Life logo. Green & Blacks said in a statement: "Cocoa Life, which is independently verified, means Green and Black's will build more and stronger relationships with farming communities and become an accountable partner, not just a buyer. " Image caption Cocoa beans "not available in organic at the scale required for Green and Black's"
The UK Fairtrade label is administered by the Fairtrade Foundation, an independent non-profit organisation, and appears on some 5,000 products. It claims there are more than 1.65 million farmers and workers in 1,226 producer organisations across the Fairtrade system, which guarantees decent working conditions and a minimum price for produce. Last year, it went into partnership with Cocoa Life to create "greater scale and impact for cocoa farmers and their communities". It says the partnership means that five times as much Cadbury chocolate will now be made with sustainably sourced cocoa. Fairtrade admitted: "The cocoa for Cadbury products in the UK and Ireland under Cocoa Life will not be traded according to the Fairtrade Standards of certification." But it insists farmers will not lose out: "They will instead receive a competitive price for the cocoa, additional loyalty cash payments plus further investments in projects and support to improve their farming practices and implement community action plans. "The value of all this will be at least equivalent to that previously delivered under Fairtrade." Is Cadbury's move the end for Fairtrade?